Node.js is a well known run time environment for server side and network based applications. Developers all around the world are using this platform to develop interactive and event driven applications. Node.js code runs fine on all popular web servers specially IIS and Apache. Node.js applications used java script on the backend. Node.js is a collaborative Project with Linux Foundation. Node.js is a feature rich platform and developers are exploring and implementing more and more out of this. Many renowed web apps and services are using this platform at the moment. Here are some of the noteworthy general features of Nodejs. It is lightweight, efficient, data and driven. Nodejs application testing has beeen proven to be much easier, using both automated and scripts. It is NodeJS package manager. The primary purpose of this is to install node programs. It can also be used in the development stage, it also makes it quick to specify and link dependencies. This utility runs through command line or shell only and it requires lit bit of familiarity with DOS or Shell to get hands on Nodejs app dependencies. Launch terminal for your ubuntu system and run following command to install nodejs. 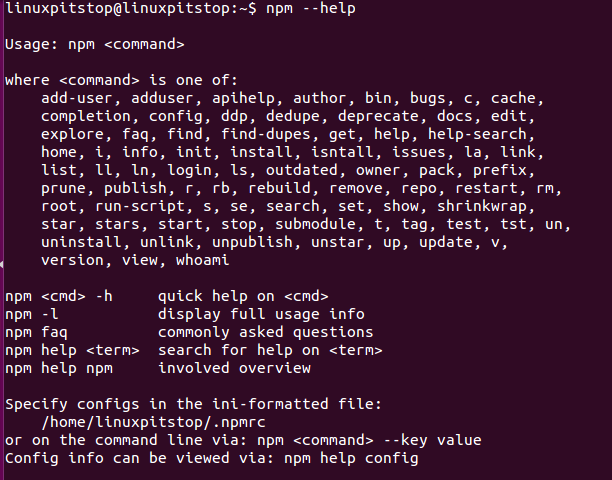 Once Nodejs has been installed, run following command on the terminal to install npm. Both of these shouldn’t take more than couple of minutes to complete. Due to the massive popularity, Nodejs package is part of ubuntu package manager now. All modern Linux operating system package manager support this. 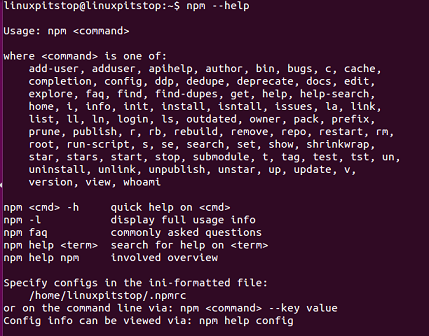 Run following command to see npm package help and different command line options. Nodejs is being used to write web applications of any size and complexity. It is being considered the future of web development and we should expect to see enhancements in this platform in near future.